When the Louny city theatre was reconstructed from 2001 till 2003, the metal fire curtain from 1963 disappeared. The curtain was painted by Zdeněk Sýkora, who is today considered not only one of the most remarkable figures in Czech art, but also a leading icon in contemporary art worldwide. Joining Sýkora in the curtain project was his friend, painter Vladislav Mirvald, who like Sýkora had built a reputation beyond the borders of his native land. The dimensions of the curtain were a respectable 7.8 by 5.8 meters, making it unlikely that the curtain was stolen by a collector. Rather, it was probably lost due to ignorance and indifference; in all likelihood the curtain met its end at the scrap heap. The Sixties are generally called a golden era for Czech culture, which is especially true for Louny. The “spiritual leader” of Louny’s cultural scene was aesthetician Josef Hlaváček, who was employed at the cultural centre. He was involved in all important developments in the town: the establishment of the “friends of the arts” club, film club and centre for higher education. But it was mainly in the area of fine art that Hlaváček became legendary. Three artists whose names went down in the history of Czech painting lived and worked in Louny: Kamil Linhart, Vladislav Mirvald and Zdeněk Sýkora. The theatre, which opened in 1950, became an important cultural institution in the city. The theatre hosted travelling performances, classical music concerts and the local amateur theatre group Tyl. In 1962 the theatre decided to decorate the heavy iron fire curtain. Unfortunately, no records are available regarding the commission. Fučík Theatre’s written records from the 1960s were not preserved and not a word about the fire curtain is mentioned in the minutes from city council meetings. The only thing that is certain is that Zdeněk Sýkora was commissioned to decorate the cutain. As the dimensions of the painted surface were huge and work had to be completed by a certain date, Sýkora asked his friend of many years, Vladislav Mirvald, to help. 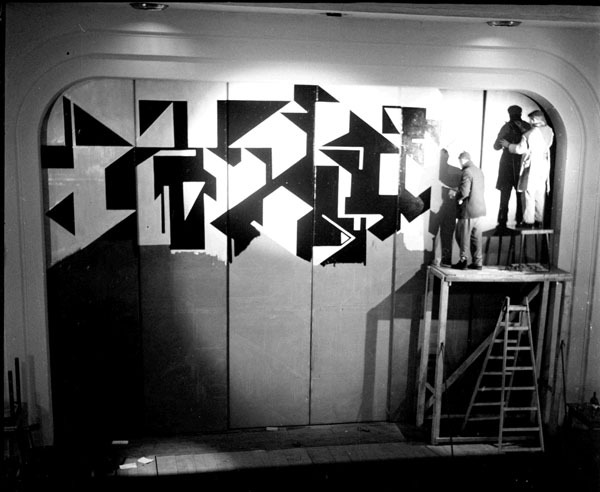 Mirvald had a close relationship with the theatre; in the Fifties he had designed posters for the theatre as well as decorations and full sets for several plays. The painting of the fire curtain can be dated to late 1962 and early 1963. In all likelihood the theatre could not host any performances while the artists were working on the curtain. In light of this, the curtain must have been painted between 28 December and 12 January, which are the dates of the last performance in 1962 and first performance the following year. That work was completed by 15 January 1963 is further confirmed by the fact that the front page of the February issue of Louny’s monthly cultural magazine features a photograph of Sýkora and Mirvald painting the curtain. A short news item inside mentions that work had been completed. The magazine’s publication deadline was usually in the middle of the previous month. The composition of the highly complex design already foresees a structural interpretation of the surface. 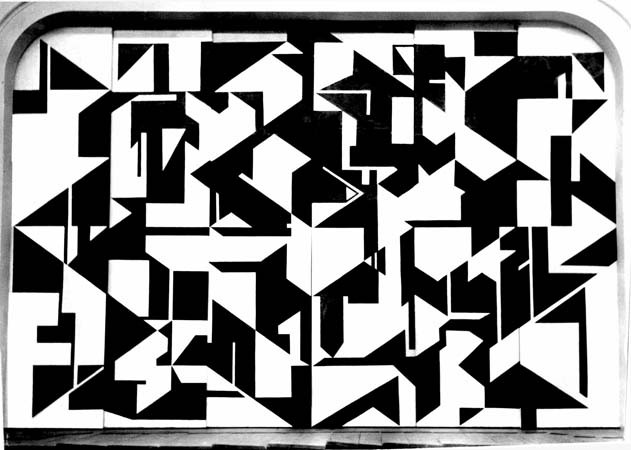 The format is divided into a right-angle grid with segments filled in with black or white paint. The resulting form emerged intuitively, from balancing out individual surfaces with respect to positivity/negativity. The rationally-based picture space and principle of repetition certainly inspired ideas on taking a more logical approach to overall picture composition. The curtain’s form allows it to be used as an autonomous set design element. In his monograph about Mirvald, Tomáš Pospiszyl recalls the 1965 production of Karel Čapek’s play The Makropulos Affair. 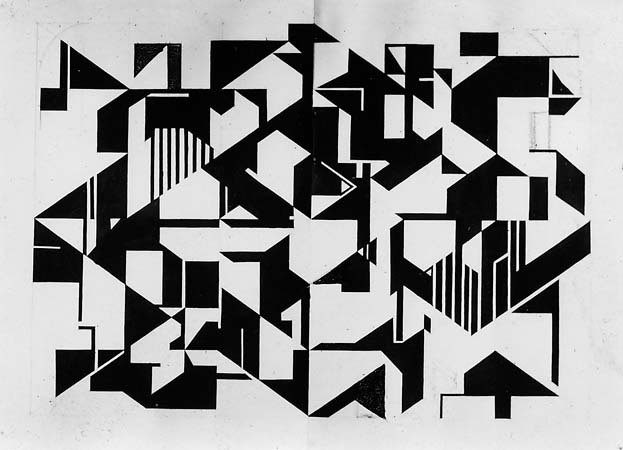 The set was designed by Vladislav Mirvald, who left the curtain half-open, thus letting it correspond with the rhomboids that dominated the stage. It cannot be ruled out whether the curtain was used more than once in this manner. The idea surfaced to renew the curtain shortly after it was destroyed, but given the technical specifications of the reconstructed theatre, it can no longer be recreated to become a functioning part of the stage. To recall this unique work, the theatre has printed a 306 x 430 cm photograph of the curtain that will hang in the foyer. Paradoxically, theatre-goers will get to see it more than the original, even though the curtain was a part of the theatre for forty years – the majority of its existence.